Description: A map of Great Russia in 1725 at the time of the death of Peter I (Peter the Great). 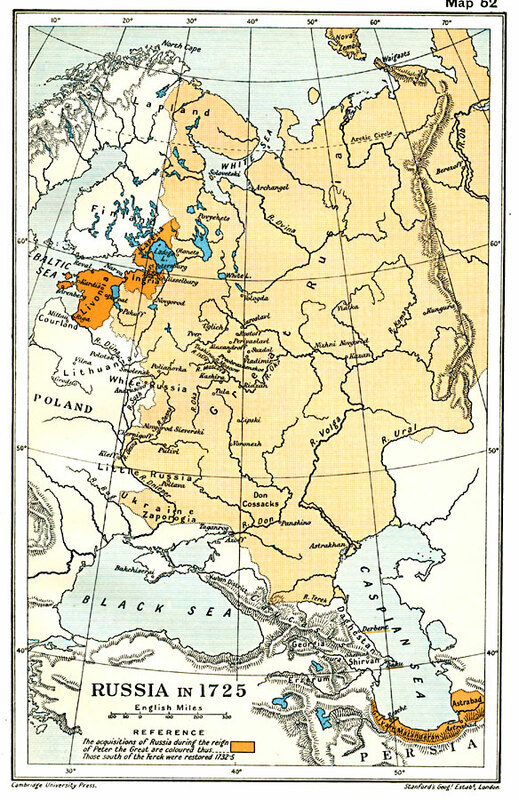 The map is color–coded to show territories acquired during his reign, including Livonia and neighboring islands in the Baltic, Ingria, Carelia, and the southern Caspian Sea territories of Gilyan, Mazanderan, and Astrabad (Golestan Province). The map notes the territories south of the River Terek (including the Caspian ports of Derbent and Baku) restored to the Persian Empire by Empress Anna Ivanova in 1732–1735 as a condition of alliance against the Ottoman Turks prior to the Russo–Turkish War (1735–1739).